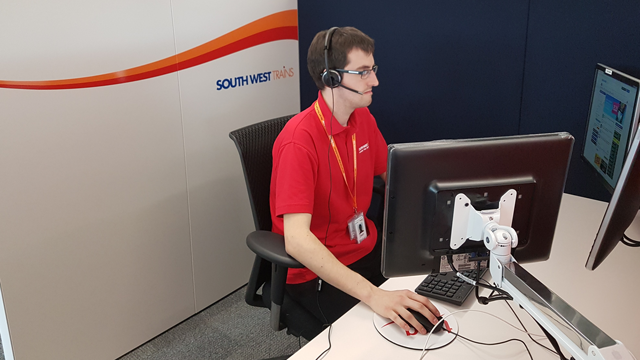 The South West Trains video contact centre, which provides real time help and advice to passengers across the network, has been officially opened. The centre is linked to new Video Ticket Machines, designed by technology company Parkeon, at 91 stations across the South West Trains network. It is believed to be first system of its kind in the country and allows passengers to talk directly to specially trained staff who can offer face to face advice and assistance, making it easier for passengers to get help and find the best value fare for their journey. Since the system went live in the summer, more than 13,000 passengers have been helped – an average of more than 150 every day. It has also been shortlisted for Innovation of the Year at the European Customer Service Awards. The contact centre was officially opened on 20 September by Arthur Pretorius, Customer Service Director for South West Trains, Councillor Simon Bound, Cabinet Member for Communities and Community Safety at Basingstoke and Deane Borough Council, and Owen Griffith, Managing Director of Transportation, from Parkeon. The state-of-the-art Video Ticket Machines offer many of the features passengers will already be familiar with, including pre-booked ticket collection and tickets for immediate travel. However, the screen also includes a ‘Help Me’ button, which a passenger can press at any time and be immediately connected to the dedicated contact centre in Basingstoke. Staff can offer advice and guidance and, if needed, take control of the passenger’s screen and complete the purchase for them. The introduction of this system is part of the £50million investment being delivered by South West Trains to improve passenger experience right across the network. “It was great to be at the official opening of the UK’s first integrated customer contact centre. We’re very proud that our Video Ticket Machines are linked to a dedicated centre with specially trained staff who can offer face to face advice 24/7 and are able to purchase tickets for passengers on their behalf. Be the first to comment on "South West Trains Open Customer Contact Centre"